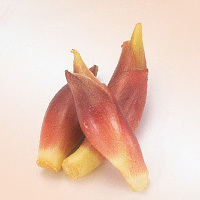 Myoga also called myoga ginger or Japanese ginger is a type of ginger used as a condiment and in foods such as Tempura. It is said to have a peculiar taste not to be confused with regular ginger. Alpha-pinene in myoga ginger is said to aid in concentration based on studies. The calories in Myoga per 97g(1pack containing 10 tp 14items) is 12 calories. Myoga is calculated to be 12Cal per 100 grams making 80Cal equivalent to 666.67g with 2.52g of mostly carbohydrates、0.87g of protein、0.1g of fat in 97g while being rich in vitamins and minerals such as Molybdenum and Vitamin K.